COFFEE SALE! 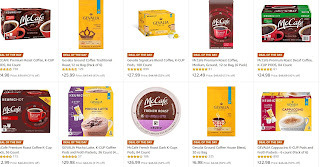 Gevalia and McCafe K-Cups or Ground Coffee on Sale: 84 Premium Roast Coffee K-Cups $23.73, 100 Gevalia K-Cups $26, 12oz Bag of Gevalia Ground Coffee $6.98, 6 Bags of 12oz McCafe Ground Coffee $22.49 + Free Shipping. All great deals!!! Valid until midnight tonight only!